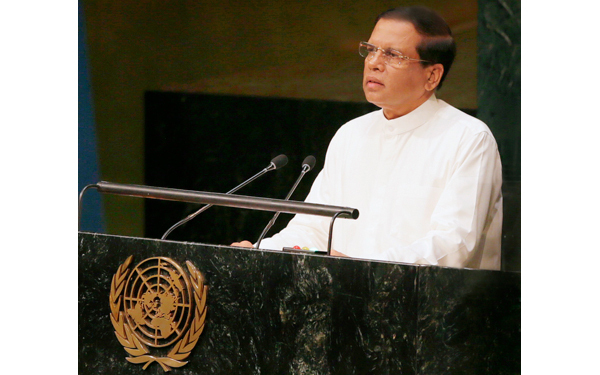 We intend to implement a new programme and plan of action in Sri Lanka to advance human rights, President Maithripala Sirisena said at the General Assembly of the United Nations during the 70th United Nations General Assembly (UNGA) Session held at the UN Headquarters yesterday. "Mr. President, Mr. Secretary-General,Excellencies,Delegates,Ladies and Gentlemen, Being a long standing member of the United Nations, it is indeed an honour and a pleasure for me to address the United Nations annual General Assembly as the newly elected President of the Democratic Socialist Republic of Sri Lanka. "Your Excellency Mogens Lykketoft, on behalf of the Government and people of Sri Lanka, please accept my heartfelt congratulations on your election as the President of the 70th Session of the General Assembly. "Let me also convey my gratitude to the former President His Excellency Sam Kutesa who contributed immensely to the achievements of the 69th Session of the General Assembly. The United Nations now has a distinguished track record of seventy years. We in the UN have consistently engaged in the responsible and challenging task of ensuring global peace, security and development during these past seventy years. However, I realize that similar challenges still lie ahead of us. "Mr. Trygve Lie, the first Secretary-General of the United Nations, when leaving office at the height of the Korean crisis in 1953 described the Secretary-General's position as: "The most impossible job in the world". It is no secret that all Secretaries-General who have held office contributed substantively to promote the universality of the United Nations and make it an organization that could serve humanity well in to the future. "The incumbent Secretary-General His Excellency Ban Ki-moon has also made an excellent contribution to the Organization. Secretary General Ban Ki-moon, please accept my honoured gratitude and that of my people for the service you have rendered. "Mr. President,Sri Lanka has been a member of the United Nations for sixty years. As a member state we have played a very active and responsible role in this organization. Sri Lanka is a nation that respects the purposes and principles of the Charter of the United Nations and international conventions and treaties. A main objective of the UN is to recognize, safeguard and promote human rights. "Sri Lanka remains committed to fulfil this responsibility. In this respect, we intend implementing a new programme and plan of action in Sri Lanka to advance human rights. Sri Lanka plays a multi-faceted role in the United Nations. Our contribution to UN peacekeeping missions that began in the 1960s continues. Sri Lanka looks forward to enhancing further, our committed contribution to UN Peace Keeping in the future. "Mr. President,A new era of democracy dawned in Sri Lanka on January 8, 2015 ushering in justice, freedom and equality. Our social and human development approach is founded on pluralism, reconciliation and sustainable development. The development vision of my Government for the next five years is also based on the same. "The theme of this Session - "Seventy Years of the UN: the Way Forward to Peace, Security and Human Rights", is therefore very much in consonance with the vision of my Government. Moreover, my Government is committed to developing a proactive and practical programme in Sri Lanka to further ensure peace, security and human rights.Mr. President,The people of Sri Lanka elected a new President and a new Government in two consecutive elections during the last eight months. Within the first six months, my Government introduced essential amendments to the Constitution in order to strengthen democracy in Sri Lanka. These amendments have reinforced the foundations of good governance through institutional reforms that strengthened pluralism and democracy. "With my personal intervention and facilitation, some of the executive powers vested in the Presidency were transferred to the Parliament and other independent institutions. "Following the General Elections in August this year, I was able to unite the two major political parties in the country to create an alliance for consensual governance in the country, changing the confrontational political culture that prevailed in the country for six decades.Our new vision for the country involves achieving the twin objectives of sustainable development and reconciliation. A fundamental requirement in this context is dealing with the past honestly and building a modern Sri Lankan Nation. "In dealing with the past, we will follow a process of truth seeking, justice, reparation and non-recurrence. It is imperative that Sri Lanka adopts a new social, economic and political approach to rise up to the challenges of the 21st century. In this regard, reconciliation receives priority attention in my country. The new consensual government under my leadership has already taken several steps to introduce and operationalize constitutional and institutional reforms required to accelerate the achievement of these goals. "Mr. President,Sri Lanka is a country that has suffered from conflict. While conflict brings destruction to a society, there are also many lessons that could be learnt during and after a conflict. All forms of war and terrorism are a disgrace to humanity. The Preamble of the Universal Declaration of Human Rights states the manner in which such rebellions break out. Whatever their root cause is, the challenge of this era is to find ways and means to defeat such brutality against humanity. Resorting to terrorism as a means to solve grievances as well as action taken to eliminate terrorism can create problems. Sri Lanka succeeded in eliminating terrorism, which continues to throttle other developing countries extending from Asia to Africa and Latin America. "We defeated one of the world's most ruthless terror outfits. Equally, our post conflict experiences also have been significant. We believe that all these experiences can be shared fruitfully with other developing countries affected by terrorism. Sri Lanka remains prepared to engage in a more active dialogue with these countries and will continue to speak and advocate against terrorism. "Mr. President, It is in this context that I wish to address the theme of this Session. We all know that the United Nations was established with the objective of preventing the recurrence of human tragedies derogatory to mankind that took place in the twentieth century. The theme this year is: "Peace, Security and Human Rights". This theme motivates us to review whether we have lived up to the initial expectations of the United Nations during the past seven decades. "Mr. President,I believe that for global development, it is important to have a dialogue within the South as much as between the North and South. My country that represents the South can contribute immensely to nurture such South-South dialogue. "Mr. President,Sri Lanka is in the forefront among the oldest representative democracies in the South Asian region. We have been fortunate in preserving the democratic ethos in our country despite the prolonged conflict. Despite several factors militating against maintaining a high economic growth rate, we succeeded in sustaining the state social welfare policies that were carried over from Independence. "We never compromised on these policies which includes universal free education, free healthcare and eradication of poverty. Following a path of social democracy, Sri Lanka has succeeded in achieving high levels in the Human Development Index, even during the years of conflict. This success is testimony to our commitment for achieving the Millennium Development Goals of the United Nations. "Mr. President,Development should result in the empowerment of women and youth and assure security for children. Frustration in youth usually leads to conflict. Nevertheless, Youth is the driving force for sustainable development. Therefore, we should transform the youth to a totally skilled workforce to succeed in the 21stcentury knowledge-based world. It should be a lead component of the Post 2015 Sustainable Development Agenda. "We should similarly launch a national programme to empower women and thereby enhance their contribution in development. Special programmes to protect the children and safeguard their rights are also an essential factor to develop an efficient and humane society. "My understanding of sustainable development is not to have sectorally or group-wise isolated development, but to have an inclusive model of development that is capable of uplifting development standards globally. For this purpose, I stress on the need for a fresh universal approach. "Mr. President,As we learn from the Buddhist ethos prevalent in Sri Lanka, I recognize there are three kinds of human conflicts. The first is the conflict between the human being and nature. We are constantly engaged in this conflict in order to enjoy material comforts in life. As a result, modern human beings seek to exploit natural resources extensively in the name of development. "The second is the conflict between 'human' and 'human'. Such conflicts occur among individuals, among communities and among nations. The Universal Declaration of Human Rights affirms that such conflicts occur when human rights are not protected by rule of law. The third is the conflict within the human being.The two kinds of conflict I mentioned earlier occur when we lose the battle within us as human beings. Therefore, this is the root cause of all conflicts. "Mr. President,Extremism, over-consumption, arbitrary exploitation of the environment, violation of human rights, vicious disparities in income are all results of our inability to overcome our craving. Among other problems, they cause insecurity, conflict, violation of rights, and exploitation. The edifice of sustainable development should therefore be built upon the foundation of self-discipline and equity. If this could be practised at a personal, community, national and global level, it would mark a giant leap forward for human kind.I propose that we, as national leaders, take cognizance of this self-discipline and equity-based approach when drawing relevant Action Plans for the future. "May the Noble Triple Gem Bless You".